"Always-perfect Milky Way - I'm a bit obsessed!" COMMENTS: Gorgeous, as always with Milky Way. Incredible detail, artistry, strength, ease-of-use. Milky way is the best! 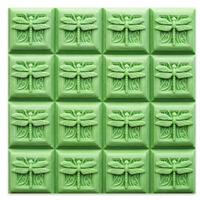 COMMENTS: Like the design, love dragonflies! Easy to unmold & clean. 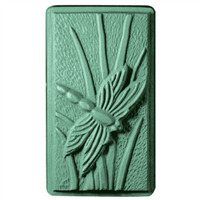 COMMENTS: This dragonfly soap mold was just the perfect size for all uses. Used for cold soap process and it popped out relatively easy. Detail was clear and beautiful! COMMENTS: I like this mold. The detail is clean and looks very pretty. The description states 4 oz. but I only got about 3.5 oz bar from mine (a little disappointed with this). Releases well. "The measurements listed don’t match the mold. How many ounces will this mold hold?" Staff Answer These measurements are accurate. Each cavity holds about 4 ounces and the entire mold yields 12 ounces. 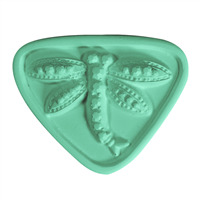 "Would a soap or lotion bar from this mold fit in your 4 oz. silver tin?" Staff Answer The cavities of this mold are 2 7/8" in Diameter and 1 1/8" deep. If you don't fill them all the way they will fit in the 4oz tins.